Elephants are social animals. Maggie and Annabelle used to live together at the Alaska Zoo. But after Annabelle died, Maggie was all alone. For years, zookeepers tried to keep her happy (and warm). But ultimately they sent Maggie to live at a sanctuary (PAWS). Now she is happy and at home with her new herd of other elephants. This is a heartwarming story of how zoos ensure the best for the animals in their care—even if the best is not at their zoo. 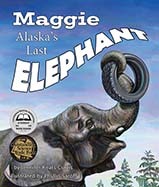 A Spring 2018 release from Arbordale Publishing, Maggie, Alaska's Last Elephant starts out somewhat sad. It tells of two elephants who live in a zoo and keep each other company. Unfortunately, one of the elephants dies and the other is left feeling sad. She befriends a tire. Maggie, the remaining elephant, gets sick one day and it's determined that she needs to be moved to a warm place with her own kind. In order for this to happen, Maggie had to learn how to stay still in a large crate while it was flown on a plane. Once the elephant was transferred to PAWS, a rescue group, she was encouraged to rebuild her strength and meet other elephants. The story has a happy ending, with Maggie being acquainted with animals of the same kind and being much happier in her new home. Although this book has colored illustrations, the story itself is based on true events. 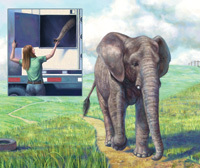 It's a story that tells the process in which Maggie was transported from the zoo to her new home. There's details on how Maggie is introduced to the new place and the new elephants. Readers will also learn what elephants like and how they behave. The "For Creative Minds" section in the back of the book, after the story, goes into detail about elephant herds and elephants in zoos. There's also an informative Q & A with Maggie's current keeper, Michelle Harvey. 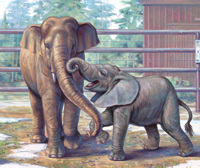 One person will win a Maggie, Alaska's Last Elephant children's book. Elephants are definitely one of my favorite animals to see at the zoo! They are so amazing! I was actually able to ride one as a kid, and it was a memory I will cherish forever. :) I also love watching the monkeys, they are so funny! We enjoy watching the penguins. My favorite animal at the zoo is the tigers. I love big cats( and small ones...lol). The elephants at the Houston Zoo make me sad. They just don't seem to have enough room. I do like the bats! Giraffes and elephants are my two favorites. I wish our local zoo had them. I like watching the big cats. They are so graceful. But I wouldn't want to meet them in the wild. My favorite thing to see is the monkeys. I like the giraffe's. Their patterns and long necks are just so cool! They also seem so gentle. I like to watch giraffes as well as seals. I like seeing the parrots. I love to see the turtles. we love to go to the zoo. My favorite part is watching the monkeys. the lions are my favorite. i love them. Elephants are my favorite zoo animals. I love the tigers at the zoo and really any big cat or monkey ☺. We like to see the eagles. My favorite animal to visit at the zoo is the gorilla. Monkey is one of our favorites to see in the zoo! I love to see the Polar Bear at the zoo...they are so cool! I always like the tigers! Our favorite is the polar bears! I think my favorite are the giraffes.